Weston declared that he would uphold a negative answer to the first question and a positive answer to the second one. “This evening a special session of the International. A good old fellow, an old Owenist, Weston (carpenter) has put forward the two following propositions, which he is continually defending in the Beehive: (1) that a general rise in the rate of wages would be of no use to the workers; (2) that therefore, etc., the trade unions have a harmful effect. “If these two propositions, in which he alone in our society believes, were accepted, we should be turned into a joke both on account of the trade unions here and of the infection of strikes which now prevails on the Continent. ... I am, of course, expected to supply refutation. I ought really therefore to have worked out my reply for this evening, but thought it more important to write on at my book and so shall have to depend upon improvisation. “Of course I know beforehand what the two main points are: (1) That the wages of labour determine the value of commodities, (2) that if the capitalists pay five instead of four shillings today, they will sell their commodities for five instead of four shillings tomorrow (being enabled to do so by the increased demand). I have read a paper in the Central Council (it would make two printer’s sheets perhaps) on the question brought up by Mr. Weston as to the effect of a general rise of wages, etc. The first part of it was an answer to Weston’s nonsense; the second, a theoretical explanation, in so far as the occasion was suited to this. Now the people want to have this printed. On the one hand, this might perhaps be useful, since they are connected with John Stuart Mill, Professor Beasley, Harrison, etc. On the other hand I have the following doubts: (1) It is none too flattering to have Mister Weston as one’s opponent; (2) in the second part the thing contains, in an extremely condensed but relatively popular form, much that is new, taken in advance from my book, while at the same time it has necessarily to slur over all sorts of things. The question is, whether such anticipation is expedient? 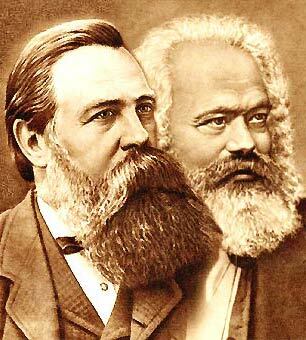 The work, however, was not published either by Marx or Engels. It was found among Marx’s papers after Engels’ death and published by Marx’s daughter, Eleanor Aveling. In the English language it was published under the title of Value, Price and Profit, while the German translation bore the title of Wages, Price and Profit. This work, as Marx himself noted, falls into two parts. In the first part, Marx, while criticizing Weston, is at the same time essentially attacking the so-called “theory of wages fund,” which had been presented in the main by Weston in his report, and which had John Stuart Mill as its most formidable supporter. The gist if the theory of wages fund is the assertion that the capital which may be expended in any given period for the payment of wages is a rigid and definite sum which cannot be augmented; and that therefore the wages of each worker are arrived at by dividing up this wages fund amount the total number of workers in the country. From this theory it would follow that the struggle of the working class to raise wages is inexpedient and even harmful. This theory was thus a weapon in the hands of employers in their struggle against the working masses. From the denial of the expediency of the economic struggle, this theory leads directly to a denial of the expediency of the political struggle of the workers, of the struggle against capitalism and consequently preaches to the workers political abstinence, and, at best, political subservience to the tutelage and leadership of the bourgeoisie. By presenting such views at the sessions of the General Council, Weston showed himself to be essentially a mouthpiece of bourgeoisie views. This was why Marx deemed it necessary to subject Weston’s views to an annihilating criticism in a special counter-report. The subject dealt with by Marx has lost none of its actuality at the present day. The ideas underlying the theory of “wage fund” continue to be put forward in more or less disguised forms, not only by capitalist economists but also by the social fascist trade union and reformist leadership in their arguments for acceptance of wage cuts. In the second part of the present work Marx give popular exposition of the fundamental theses of the theories of value and surplus value and of the conclusions derived from these theories. As is mentioned by Marx in his letter to Engels, this part contains an exposition of several theses from his book Capital on which he was working at the time. Although it is so condensed, this part of the work nevertheless constitutes a model of lucid exposition and a consummate popularization of the economic theory of Marx. A study of this pamphlet is still the best introduction to Marx’s Capital. 1. This phrase was written in English. – Ed. 3. K. Marx and F. Engels, Correspondence 1846-1895, pp. 202-203. – Ed. 4. One sheet is 16 printed pages. – Ed. The circumstances under which this paper was read are narrated at the beginning of the work. The paper was never published during the lifetime of Marx. It was found amongst his papers after the death of Engels. Among many other characteristics of Marx, this paper shows two especially. These are his patient willingness to make the meaning of his ideas plain to the humblest student, and the extraordinary clearness of those ideas. In a partial sense the present volume is an epitome of the first volume of Capital. More than one of us have attempted to analyze and simplify that volume, with not too much success perhaps. In fact, a witty friend and commentator has suggested that what is now required is an explanation by Marx of our explanations of him. I am often asked what is the best succession of books for the student to acquire the fundamental principles of Socialism. The question is a difficult one to answer. But, by way of suggestion, one might say, first, Engels' Socialism, Scientific And Utopian, then the present work, the first volume of Capital, and the Student's Marx. My small part in the preparation of this work has been reading the manuscript, making a few suggestions as to English forms of expression, dividing the work up into chapters and naming the chapters, and revising the proofs for press. All the rest, and by far the most important part, of the work has been done by her whose name appears on the title page. The present volume has already been translated into German. Moreover, you will understand, that if there were ten men receiving each 2s. per week, five men receiving each 5s., and five men receiving 11s. weekly, the twenty men together would receive 100s., or 5 Pounds, weekly. If then a rise, say by 20 per cent, upon the aggregate sum of their weekly wages took place, there would be an advance from 5 Pounds to 6 Pounds. Taking the average, we might say that the general rate of wages had risen by 25 per cent, although, in fact, the wages of the ten men had remained stationary, the wages of the one lot of five men had risen from 5s. to 6s. only, and the wages of the other lot of five from 55s. to 70s. One half of the men would not have improved at all their position, one quarter would have improved it in an imperceptible degree, and only one quarter would have bettered it really. Still, reckoning by the average, the total amount of the wages of those twenty men would have increased by 25 per cent, and as far as the aggregate capital that employs them, and the prices of the commodities they produce, are concerned, it would be exactly the same as if all of them had equally shared in the average rise of wages. In the case of agricultural labour, the standard wages being very different in the different counties of England and Scotland, the rise affected them very unequally. We can only say that, the limits of the working day being given, the maximum of profit corresponds to the physical minimum of wages; and that wages being given, the maximum of profit corresponds to such a prolongation of the working day as is compatible with the physical forces of the labourer. The maximum of profit is therefore limited by the physical minimum of wages and the physical maximum of the working day. It is evident that between the two limits of the maximum rate of profit and immense scale of variations is possible. The fixation of its actual degree is only settled by the continuous struggle between capital and labour, the capitalist constantly tending to reduce wages to their physical minimum, and to extend the working day to its physical maximum, while the working man constantly presses in the opposite direction.